Enjoy Ocean views from this two bedroom, two bathroom condo at the popular, Maui Sunset Resort. This large condo can accommodate up to six guests. The master bedroom has a King bed and en-suite. The second bedroom has a queen bed and twin bunk-beds. The fully equipped kitchen is open to the dining and living area, all of which open to the lanai. 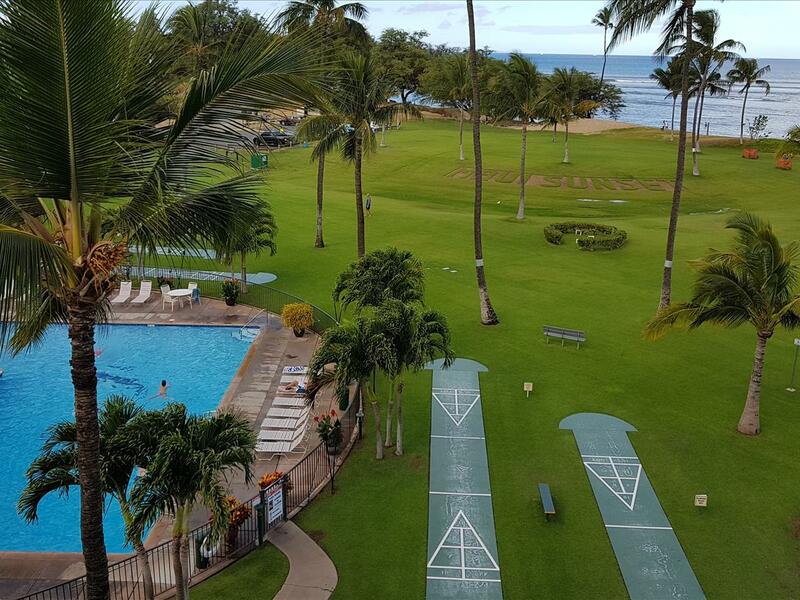 The lanai is a great place to relax and enjoy the ocean views or a home-cooked meal. This condo features an air conditioning unit in the living room, the master bedroom and the second bedroom. There is free WiFi. There is a TV in the living room as well as the master bedroom. The Maui Sunset is an Ocean front property that sits on a long stretch of beach, where you can enjoy morning or evening strolls on the beach while watching wind surfers or the sunset. There is a tennis court available for guest use.